Ideas for a Mardi Gras theme birthday party. Lots of different ideas for Mardi Gras games, invitations, decorations, party games, activities, food, favors and much more! Write the information on the back of masks and ask guests to wear them to the party. Attach a small colorful invitation to Mardi Gras beads and send to guests. Glue feathers and glitter to blank colorful cards. Ask guests to dress in costume and give a prize for the most original one. Great colors are combinations of deep purple, blue, gold, green and touches of black. Outside the venue hang Mardi Gras beads from the branches of trees and bushes. Place a sign in the front yard that says "Welcome to New Orleans!" . Cover the front door with Mardi Gras themed wrapping paper or a large banner. Make or buy colorful pinwheels and stick them in the ground about 2 feet apart along the walkway. Place a green or purple carpet that is long and thin leading up to the doorway and decorate the outside of the door to look like a giant gold Mardi Gras mask. Hang stings of beads from the entrance that the guests will have to walk through to get into the party. Decorate the kids party table in bright festive colors. Mardi Gras beads can also be used to wrap around napkins for a napkin ring. 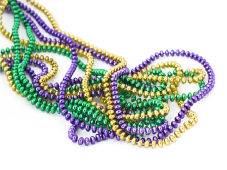 Lay lots of Mardi Gras bead on the party table, hanging over candelabras and around the party area. Mardi Gras is over the top so use large masks on the wall and anything gold and glittery. Set out lots of glow in the dark necklaces, glow sticks and bracelets for the kids to wear. Decorate the bowls and dishes you use to serve food with the glow in the dark necklaces by placing them around the bowls. Give guests 3 strings of Mardi Gras beads when they enter the party. The beads need to be all the same color for every guest ... different then what you have decorated the party room with to avoid cheating. Choose three words that the guests are not allowed to say during the party and write them on a poster or white board where everyone can see them. When you give the guests their beads tell them that for the whole party they are not allowed to use those three words. Some good words to choose are the birthday child's name, beads, fun, etc. If a guest is caught saying one of the 3 words then the person who caught them gets to take one of their strands of beads from them. Play for the whole party and at the end of the party the guest with the most beads wins a prize. Transform the birthday guests with face paint. Set up a station and have an adult paint the kids faces to look like animals or simply paint on fleur de lies' or stars. Set out lots of fun things that the kids can get dressed up such as colorful plastic fedora hats, feather boas, big sunglasses, king and queen crowns, wigs, masks, joker hats, beads, etc. Make the Mardi Gras party extra special with some carnival style games. We have some great carnival games listed that are easy to put together and fun for all ages. Have an adult dress up character and make balloon animals as they wait in line for the games. Make the piñata extra fun by adding a small plastic baby to the prizes inside the piñata. Whoever finds the baby gets an extra prize! Turn on fast music and have two people hold a long string of Mardi Gras beads for the kids to limbo under. When a player is out have them take the place of one of the people holding the beads so everyone gets to play. Mardi Gras is also called Fat Tuesday and refers to the events or Carnival type celebrations which begin on or just after the Christian feasts of the Epiphany (Three King's Day) and culminating on the day before Ash Wednesday. Mardi Gras is French and is translated "Fat Tuesday". Fat Tuesday refers to participants eating rich and fattening foods before they participate in the ritual fasting of Lent. Some traditions for Mardi Gras are: wearing costumes and masks, dancing, elaborate parades, etc. All signs point to the 1st Mardi Gras celebration in the US happening on 3/3/1699. French explorers landed in Louisiana and called the area Point du Mardi Gras. The area they landed near was the current New Orleans, Louisiana. As time progressed other French settlements began to also mark the holiday with masquerade balls, street parties and large feasts. The Spanish banned the celebrations after they took over New Orleans. The bans were lifted when Louisiana became a state in the year 1812. In a Mardi Gras celebration in 1827 students paraded in costumes and danced in the streets mimicking the type of Mardi Gras parties they had witnessed in Paris. 10 years later the city of New Orleans recorded it’s first official Mardi Gras parade. Some customs from the Mardi Gras parades entail throwing strings of beads and trinkets, decorating floats for the parade, wearing masquerade masks and eating yummy King Cake. The King Cake is a Mardi Gras tradition that was brought to New Orleans in 1870 from France. The King Cake is oval and a cross between French pastry and coffee cake. The King Cake is decorated in green, purple and gold. A small plastic baby is baked into the cake and whoever finds the baby is expected to host the next party and bring a King Cake to share. Kids, tweens, preteens and teenage party planning ideas for children ages 1, 2, 3, 4, 5, 6, 7, 8, 9, 10, 11, 12, 13, 14, 15, 16, 17 and 18 years old diy party planning ideas for kids birthday parties and moms and dads.